The Evening News is calling for a fair deal for families who are facing having to pay almost �30 to see relatives for a Sunday visit. The director of the Cockburn Association has backed the Evening News to introduce visitor parking permits for city centre families. New seven day charges in city centre zones 1-4 are to be introduced within months, and thousands of families there who have traditionally had to wait until Sunday for relatives from out of town to visit them because there is presently no scheme on offer where they can give out passes to friends will have to fork out as much as £27 for a six-hour stay. We are calling for councillors to see commonsense and bring in “granny passes” – already used in other cities across the UK – so family life can be maintained. Terry Levinthal, director of the Cockburn Association, lives in Zone 2 and has thrown his weight behind the campaign, feeling it will benefit city centre residents. He said: “The idea of a temporary arrangement for visitors is a great idea. I think it’s fantastic that the Evening News is looking into this issue. In Newcastle, residents are able to purchase a visitor permit for as little as £25 per year if their property is within a parking permit area. Supplementary scratchcards, priced at £2 a day and £1 for half a day, were also introduced throughout the city to meet residents’ needs for family gatherings and social occasions as well as supporting additional business and community requirements. Each household can request up to 60 passes over a 12-month period. Meanwhile residents in York city centre can buy a book of five one-day scratchcards for £6.25, with families allowed six books per month. York City Council reduces this fee to £1.50 per book for a range of people including those who are over 60 years old, hold a blue disabled badge, registered blind or in receipt of Job Seeker’s Allowance. A similar scheme in Newham, London, lets residents receive 30 free one-day resident visitor parking permits per year. There is then scope to buy a maximum of 20 permits per month if required with a pack of five 24-hour passes setting back a home owner £25. Parking charges in Edinburgh are to be introduced on Sundays in the coming months in an effort to tackle the city’s growing traffic congestion and help reduce soaring air pollution rates. Mr Levinthal added: “The Sunday parking charges is something that has been in the pipeline for years. “I think the idea to bring in Sunday charges has to be welcomed. Sunday is the day you see the most cars in Edinburgh city centre, particularly the residential New Town. You see what I call densely dynamic parking – drivers constantly looking around for a free parking space. “That then creates issues for people who live in the city centre who don’t want to use their cars in case they spot and then can’t get a space back in the postcode they live in. “Edinburgh is home to a diverse mix of residents and in terms of impact it is critical that appropriate mechanisms are in place so everyone has the same opportunities. There needs to be data analysis to show how the current regime is operating. 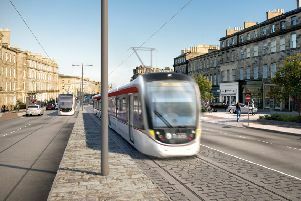 “It would also help if public transport in the city was cheaper and would be a more attractive option.